Tubes:2012PSPCYBERTUBES-003\paisagemnetlc\passaros ( arquivo net) . 1-Abrir nova imagem transparente de 1024 x 750 pxls. _Preencher com o gradiente formado pelas cores : #4f7e48 e #93708e. 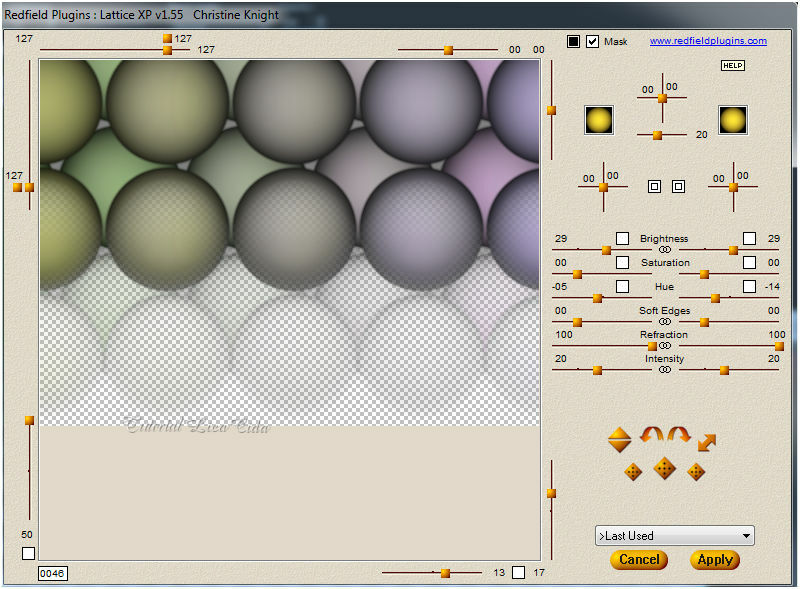 Configurar Linear. 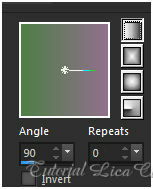 Angle 90 \ Repeats 0. Invert desmarcado. 2-Usar nessa layer a mask gradiente DW. Duplicar . Layer \ Merge\ Group. 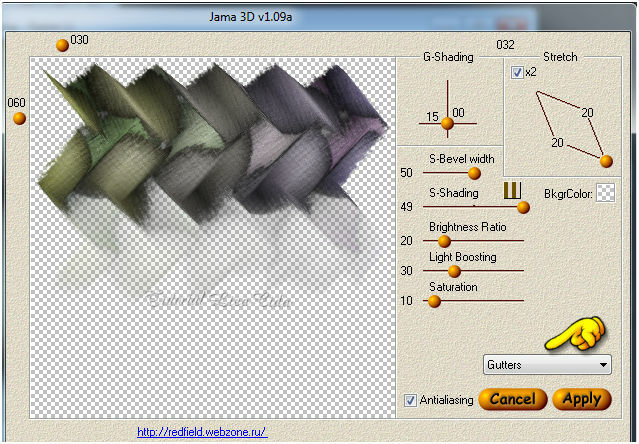 3-Plugin Redfield \ Lattice XP. 4- Plugin Redfield \ Plasteroid . _Mover para usar como piso ( usar a ferramenta Move Tool). 6- Escolha uma cor que combine para o fundo do seu trabalho . Usar a color=#425376. _Nova layer\ Send to Bottom. Pintar a layer com a cor escolhida. 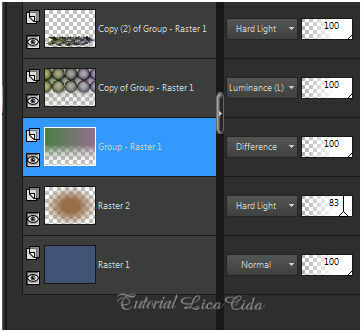 7- Edit Copy no fundo raster2 \ Paste As New Layer. 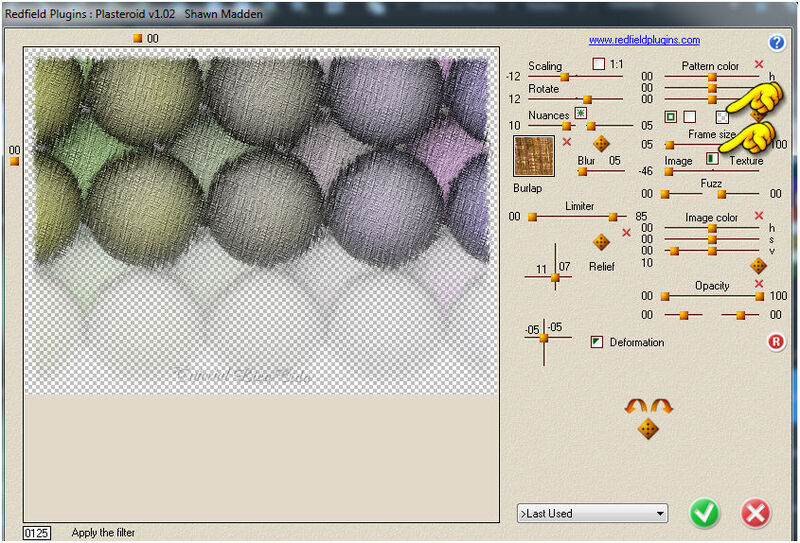 8- Ativar a layer superior ( Copy(2)of Group-Raster1). _Edit Copy na paisagemnetlc \ Paste As New Layer. 9-Edit Copy nos passaros \ Paste As New Layer. Posicione. 10-Edit Copy na bola \ Paste As New Layer. Posicione de acordo com seu tube, use a gosto. 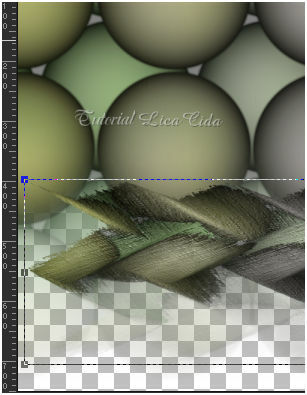 11-Edit Copy no Apophysis-93-bd-29-6-13 \ Paste As New Layer.Use como acabamento da bola. 12-Edit Copy 2012PSPCYBERTUBES-003 \ Paste As New Layer. Posicione. 13-Image add borderes 1 pxl cor #000000. _Image add borderes 40 pxls cor #ffffff \ Selecione . _Adjust\ Blur\ gaussin Blur R=45,00. _Effects\3D Effects\ Drop Shadow. 0\ 0\ 80\ 40,00 . (Color=#000000) .